The Chapter provides various opportunities for corporations, academia, non-profit organizations to promote themselves through our sponsorship programs. PMI Zimbabwe Chapter is a not for profit organization which is dedicated to the promotion of the project management profession in Zimbabwe. We are also a proud member of PMI Region 16 (Africa) Chapters. The Chapter hosts several monthly events and would like to hear from you. Join us in doing great things by submitting your bio and abstract to be considered for future events . To attend our Chapter events, you do not need to be a PMI or Chapter member. 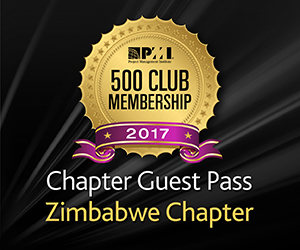 PMI Zimbabwe Chapter welcomes partnerships and sponsorship from interested parties, companies and individuals. Get in touch with us on how you can be a partner or sponsor, go to the contacts page.